When it comes to saving for big purchase goals, most of us can use all the help we can get. With The Internet of Savings® platform from InSpirAVE, consumers can not only accrue the benefit of savings from retail and financial institutions all in one place, but equally leverage the wisdom (and discretionary cash) of friends and family to make smart spending goals, design a personalized savings plan to help raise the money to meet those goals faster, and then track progress as the savings grow and those longed-for big-ticket purchases draw near – with InSpirAVE’s program relentlessly at work until the purchase arrives right at their doorstep. Pictured: InSpirAVE founder and CEO Om Kundu demonstrating the Internet of Savings® at FinovateFall 2016. InSpirAVE empowers fulfillment of big purchase goals without debt by helping Users make thoughtful purchase decisions and create a personalized savings plan to fulfill them: The magic of our Internet-of-Savings® platform helps you save faster through the support of friends and family, as well as partnering merchants and financial institutions: InSpirAVE does so by creating a new underlying set of economic incentives that have proven to be materially significant for partnering banks and merchants to encourage their customers to save. 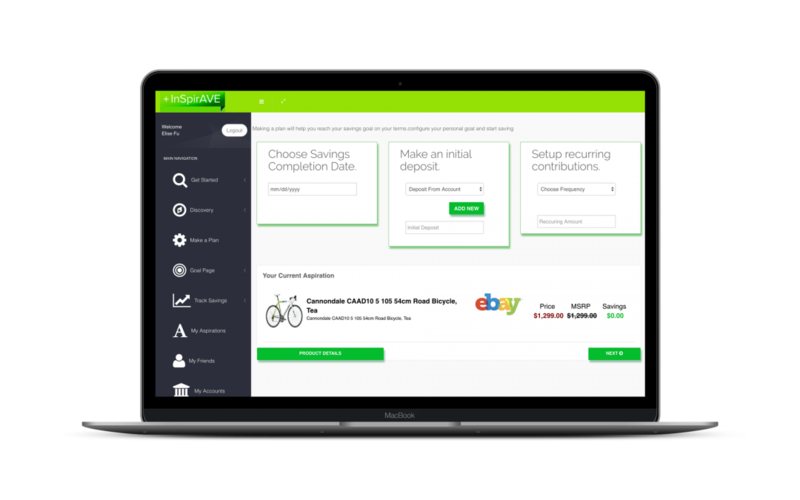 Our Internet-of-Savings® platform provides intelligent tools empowering such users with the discipline to make responsible financial decisions — it starts with thoughtfully selecting what matters, and does not stop until that purchase-goal is saved-for and fulfilled. Merchants and financial institutions partnering with InSpirAVE are equally benefiting from our socially responsible model and realizing materially enhanced revenues through greater engagement and expansion of their customer base. Users are saving faster through The Internet-of-Savings® platform by drawing from multiple sources — savings from merchants and banks, as well as contribution of friends and family — whose benefits have turned out to be an order-of-magnitude higher than what solely relying on savings from just one source would…for users as well as partnering merchants and banks.